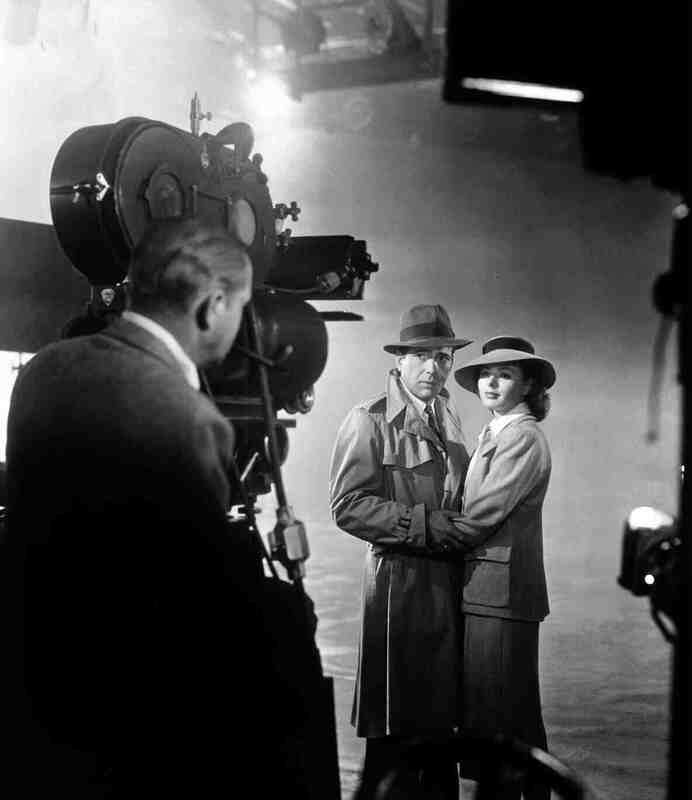 My week-long look at my favorite film “Casablanca” continues with a glance behind the scenes of this classic movie. Every film, regardless of how big or how small, has stories about its creation. 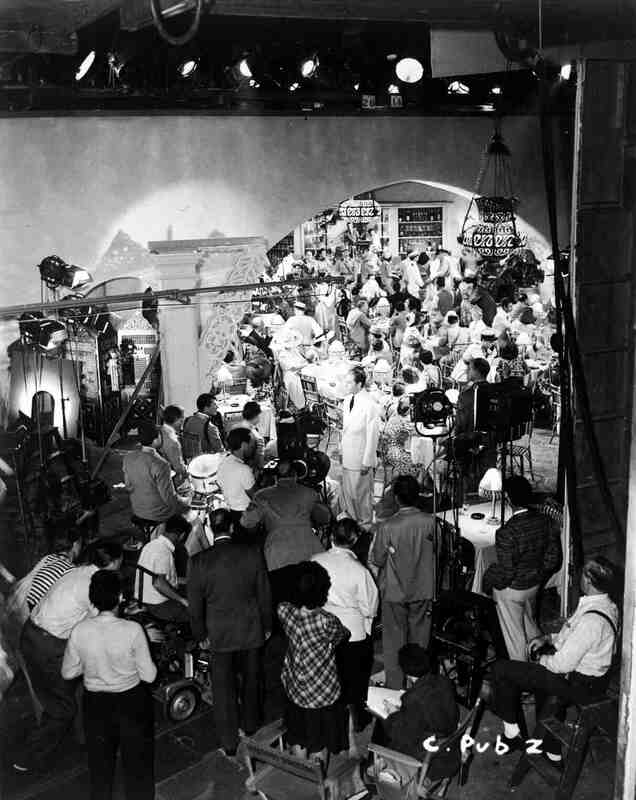 Below are a handful of behind the scenes photos that I hope fans of “Casablanca” or classic movies in general will enjoy. 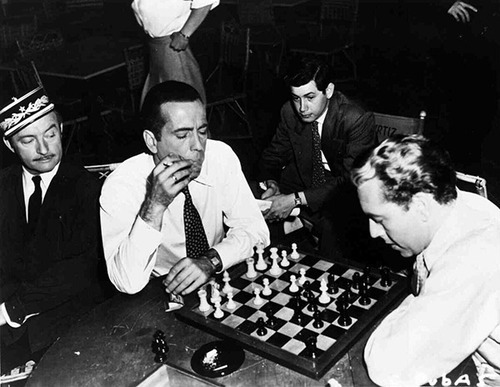 Cast members of “Casablanca” were known to spend down time enjoying competitive games of chess. In fact, it is said that while watching Bergman play, Bogart uttered “Here’s looking at you”, a phrase that he would bring into the movie via improvisation. Of course that line would become one of the film’s many memorable quotes. 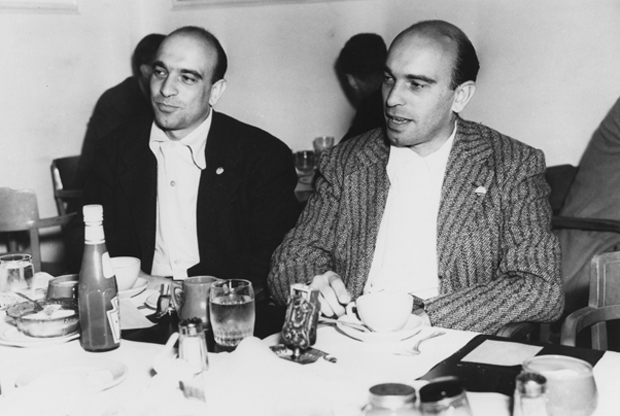 Julies and Philip Epstein were screenwriting brothers who worked on much of the “Casablanca” script. They would leave midway through to help Frank Capra on the “Why We Fight” documentary series following the bombing of Pearl Harbor. Afterwards they returned to “Casablanca” and took over for fill-in writer Howard Koch. All three men would win Oscars for their collaborative screenplay. 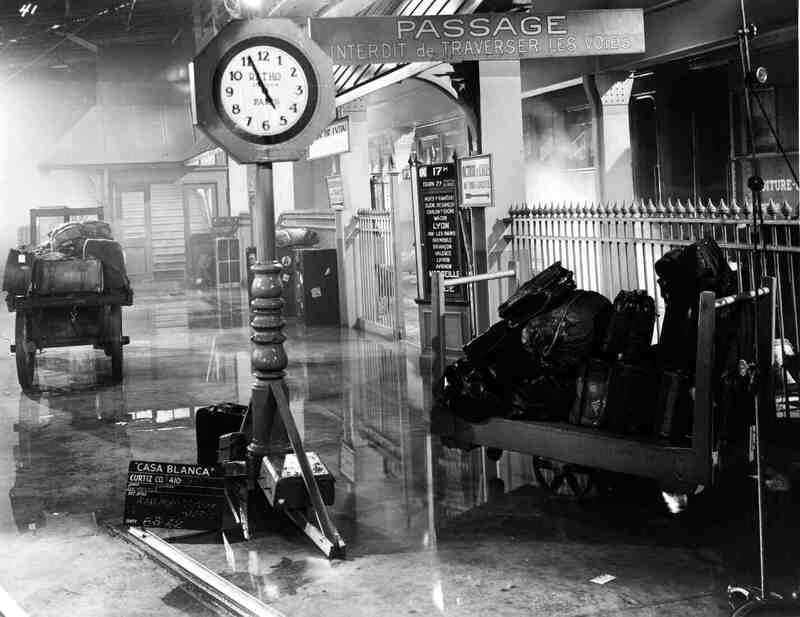 This is a studio set still of the Paris train station. The scene is important to the story as it reveals why Rick has become so callous and distant. The scene at the train station takes place as the Nazi’s are preparing to enter Paris. The chaotic flow of people trying to leave the city and the mood-setting downpour of rain helped give the scene its amazing life. 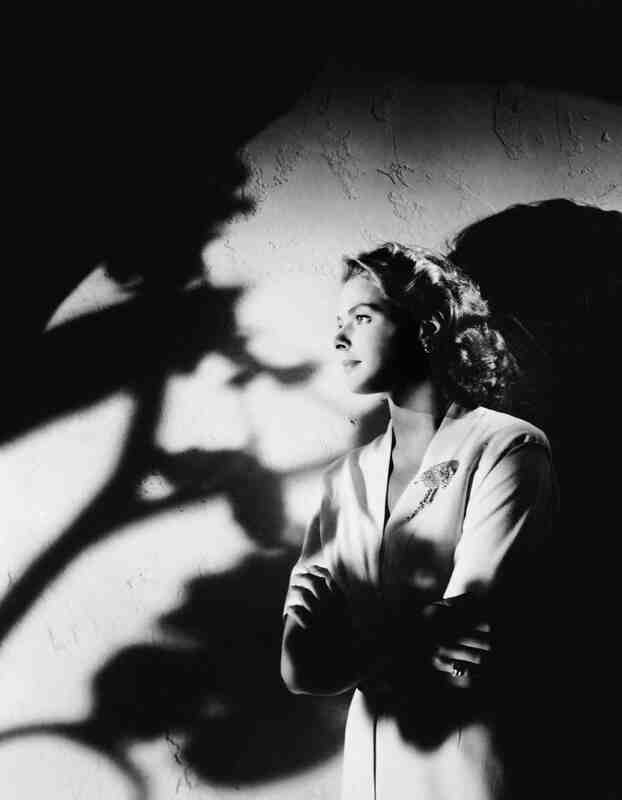 A promotional still featuring the beautiful Ingrid Bergman. At the time of her casting Bergman had decent success in Hollywood but it was “Casablanca” that catapulted her into stardom. The Swedish actress was under contract with David O. Selznick at the time but Selznick agreed to lend her to Warner Brothers in exchange for Olivia de Havilland. The rest is moviemaking history. Bergman blew audiences away and over time became one of the greatest actresses ever to grace the screen. 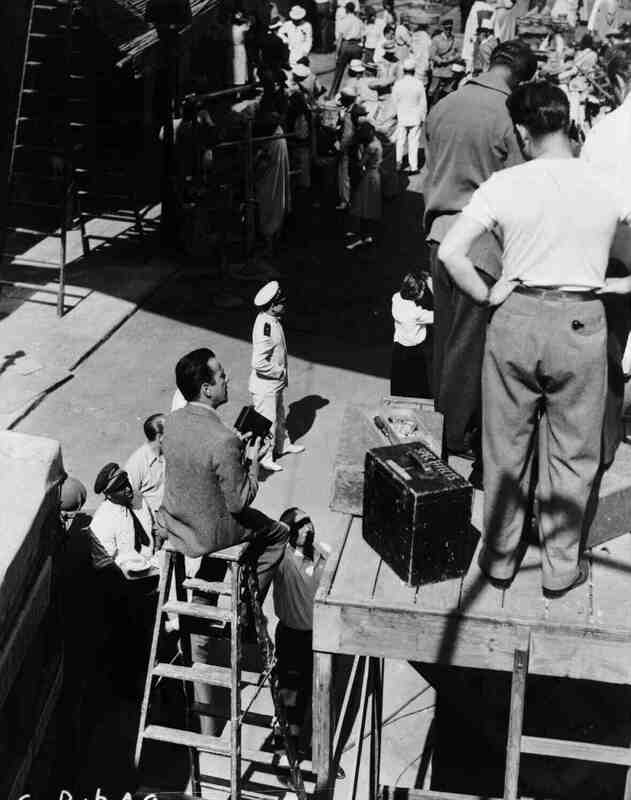 This interesting photo captures Bogart sitting on a tall ladder making some home movies of his experience on set. The scene looks to be the black market roundup sequence. Bogart made many home movies so seeing him with a video camera in his hand is no surprise. Everyone loves Rick’s. “Casablanca” features many memorable treats and one of them is Rick’s Café Américain. Much of the film takes place within the walls of Rick’s club so creating an environment filled with vibrancy was vital. Here we see the crew shooting one of the scenes in this unforgettable place. One of the key reasons why “Casablanca” is such a tremendous movie is the sizzling chemistry between Humphrey Bogart and Ingrid Bergman. Surprisingly the two never made another film together. In fact, despite their mutual respect for each other, they rarely spoke. One reason for that could have been Mayo Methot, Bogart’s volatile wife at the time. 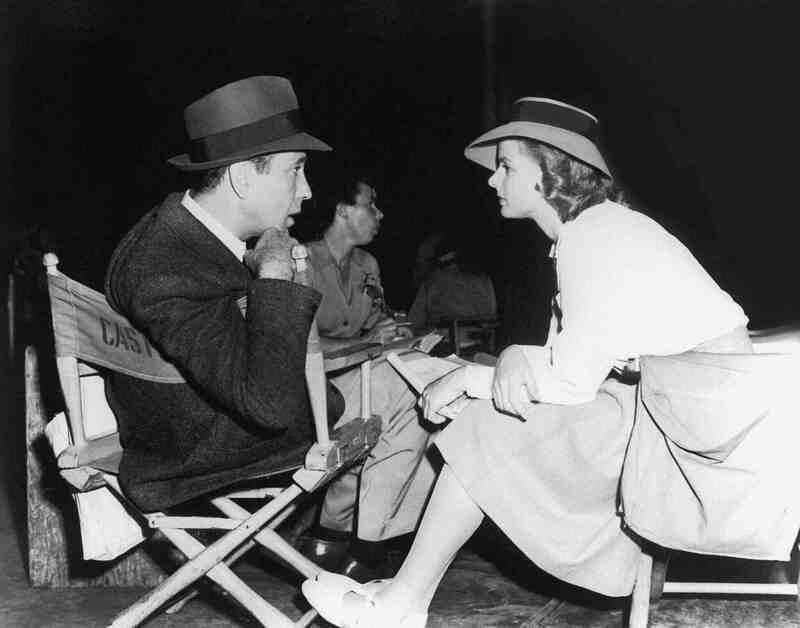 She made life tough for Bogart even storming on set one day and accusing Bogie of having an affair with Bergman. The now iconic final scene turned out to be a headache for director Michael Curtiz (seen here behind the camera) and the writing team. It featured numerous changes of course. 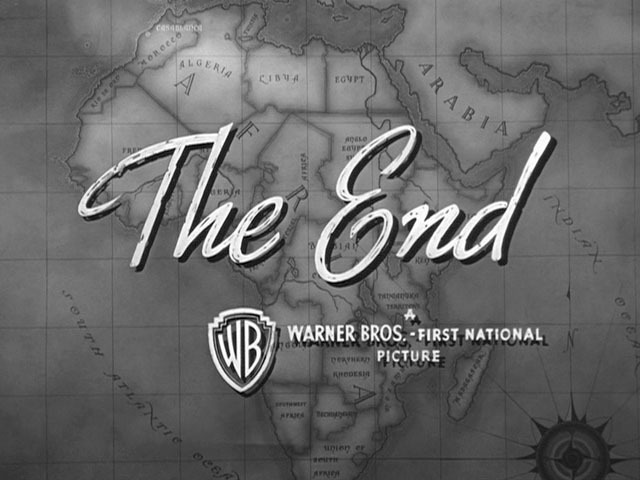 One ending had Ilsa leaving with Rick and another had her leaving with Victor. Even when that decision was made some of the cast was called back to shoot the great final shot. Many of the cast members would go on to talk about the stress of wrapping up the picture. Interesting Bogie with the camera. Fun article, Keith. Thanks Cindy. It was fun putting it together. Thanks so much. Glad you enjoyed the post and even happier that you love the film. 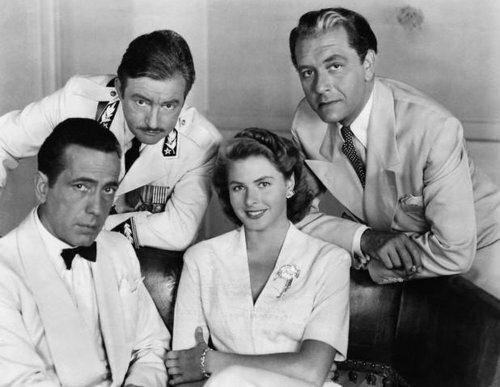 It doesn’t get much better than Casablanca does it? Thanks. Just a few of the behind-the-scenes stuff. Lotsa fun. Another great little insight into the inner workings of the film, man. Fabulous pics. Thanks bro. It was really cool putting this one together. I just love these old shots. Awesome pics here Keith! I love that last one and I did hear the final shoot was quite a nightmare for the director. It’s truly one of my favorite endings ever, too, beautiful and poignant. Thanks Ruth. I love the stories behind each of them. 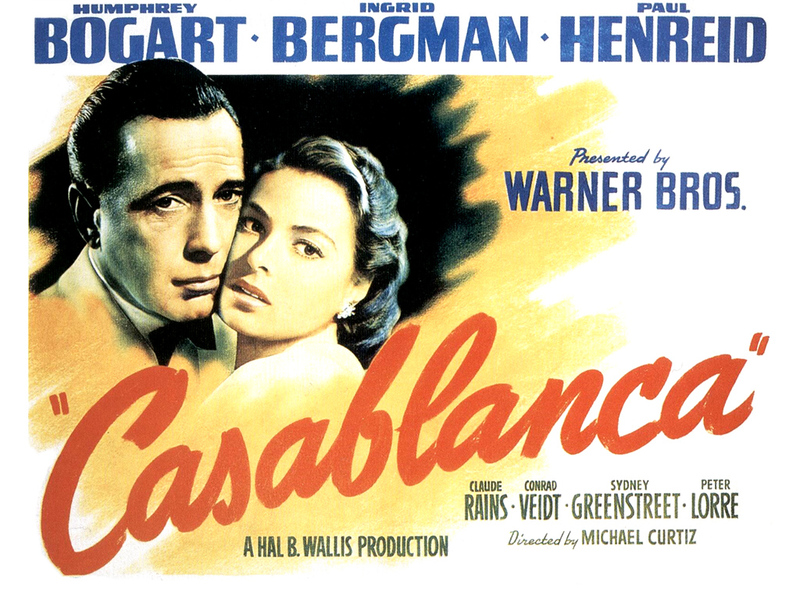 There’s so much to tell when it comes to making a movie, but a film like Casablanca is even more special to me. Love that trivia about the ‘Here’s looking at you” phrase. Really cool isn’t it? That’s a favorite of mine too. Very cool photos. Thanks for sharing these, Keith. Sure thing. I thought they were cool. Glad you enjoyed them! This post (and the pics) was all kinds of awesome. Great work! Thanks a bunch. I’m glad some enjoyed it. It was a lot of fun to put together! What a great collection of behind the scenes photos. Where did you get them, a book? Also, sorry to nitpick, but video had not been invented yet and wouldn’t be for decades… So Bogie is not holding a video camera. Home movies were shot on FILM even up until the days of Super8 film (which is what my parents used for our old home movies, extra points if you can guess how old I am from the era of Super8 film). Most likely he was shooting 16mm film.